This chapter focuses on how subjects construct histories from their own locations, or how they engage in their own historiography where collective memory becomes a tool to construct lineages of identity and work. Today the naqqash artists of Telangana trace this lineage through two genres of remembering the past—one, claiming inheritance from the deity Nimishamba whose progeny became the ancestor of the chitrakar jati and the other, belonging to a community of artists, who migrated to Deccan from Rajasthan during the Mughal empire. The simultaneity and juxtaposition of these two distinct epistemologies—that not only transcend political and cultural regimes, but also spatial–temporal realms—offer new ways of critically reflecting upon the conditions under which plural and divergent sources of identity coexist and compete with one another. 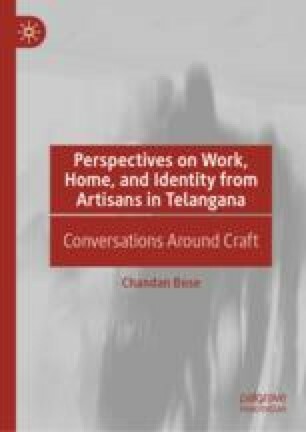 The markers of this critique not only include shared narratives about origin stories, memories pertaining to work and family, but also how the imagination of the self is not centred around a singular and bounded paradigm.